Last week was quite rough. Almost no follow through the entire week during New York session forex trading. Pretty disappointing not to see those candles moving at all. so i ended up -72 pips. I was kinda frustrated with the market so i did not feel like blogging. As we all know, human nature tend to talk only about success only. But i’m here not only to blog about my winning trades but also the losing one. Controlling emotion during these phase is a challenge. Had it happened months ago, i would have been bouncing my trade strategy from one to another. At least now, i have full trust on my strategy. It is the market that is slow. However todays main news was oil prices jumped more than 1% overnight as disruptions to production in several countries reduced supplies. The global oil industry has been hit by a combination of events, including wild fires in Canada, significant disruption in Venezuela and Nigeria and reduced production in the US and China. So my money was on Cad pairs. I really thought we will have big moves. But 2 hour after New York open, there was basically no move at all. usdcad, on a range break out…. Just right after NY open, i saw some movements in cad pairs. I quickly positioned myself on a break of USDCAD waiting for price to drop to 1.2850 and give me some healthy pips. But the price bounced back into range but i was able to get out on a break even. I have also taken range break out of GBPJPY but also did not work. Prior to NY open, nowdays i’m stalking for a good trend and position myself on a good level. So today i found one on audjpy as i saw price was bouncing from a level several times. I had a pending order on pullback but that pair as well came back and stopped me out with +5 pips. At the time of writing this blog, i see gbpjpy is moving slowly. I could have taken buy-entry from a level up but unfortunately, i missed the trade. I probably could have nabbed few pips and got out with plus. But today ending with -7 pips only. Last week was a terrible week for me. 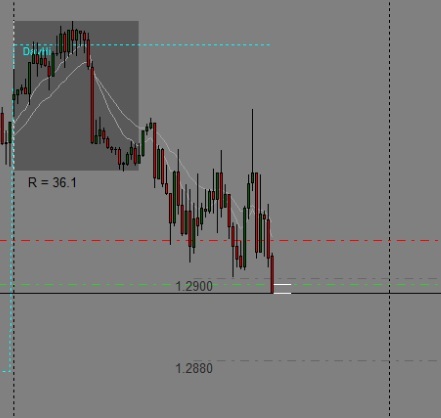 Overall i’m down -72 pips. I know one or two good trades, i would be able to wipe out my loss. Hope this Tuesday we will get some follow through to trade forex.